Want to try something new this year use the contact page to contact us. Places available across all age ranges. Osbaldwick and Murton Scout group has been running for many years and given many young people chances to experience all different types of activities that they would not normally get a chance to try. The hut is currently in use 4 nights a week by various groups from the scouting and guiding movement. We do have time slots available if anyone else would like to hire the hall for other activities. unfortunatley Osbaldwick Scout group do not have an active Beaver unit. We do work very closley with St Hilda's Beaver unit that meet at the church down TangHall Lane. If you feel you have time and would like to start up a beaver unit please get in contact Via the contact us page. Osbaldwick Cub Scouts meet on a Monday evening from 7pm till 8:30pm. You can just turn up or if you would like to confirm we are at the hut please use the contact us page. Cub Scouts are young people aged between 8 and 10 1/2, who make up the second section of the Scouting family, between Beavers and Scouts. Osbaldwick Scouts meet on a Friday evening at the scout hut in Osbaldwick from 7:30pm till 9pm. You can again just turn up but if you would like to confirm we are in the hut or need more info please contact us Via the contact page. The Scout section is for young people, usually aged between 10 1/2 to 14 years old. The Scout Troop is the third section in the Scouting family. 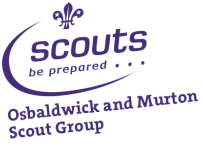 Osbaldwick do not have there own Explorer Scout unit but work closely with Phoenix Explorers which are based at Heworth and meet on a Thursday evening. There is also an Explorer Scout unit based at Snowball Plantation which meet on a Friday evening, if you have the time you can go to both. If you require more info on Explorers please contact us Via the contact page. Explorers are the fourth section of the Scouting family. Osbaldwick Scouts will be helping at the Plusnet marathon in York on 20th October. We will be stood on the finish line to greet you with a goody bag when you finish. Good luck to everyone taking part. Osbaldwick Scouts will complete a half marathon hike the Saturday before the plusnet marathon to show how hard the people running have had to train. Before finishing the hike at the scout hut for a relaxing take away tea and I night around an open fire.